It was once believed that the Maormer of Pyandonea were originally exiles from the Summerset Isle. However, translations of tapestries in the Crystal Tower tell the tale of how the Maormer were likely separated in their original homeland of Aldmeris. According to the legend, the Maormer leader King Orgnum was once a phenomenally wealthy Aldmer nobleman, who used his finances to launch a rebellion against the powers of the land. He and his followers were banished for this to a place separated from Aldmeris by an impenetrable mist, Pyandonea, "The Veil of Mist". This boundary proved so effective that the followers of Orgnum never again disturbed their former countrymen in Aldmeris. 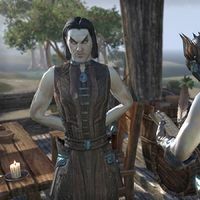 The Maormer were relentless in their drive to conquer Summerset, and there is scarcely a year throughout the First or Second Eras when they did not ravage the coastlines of the Altmer. 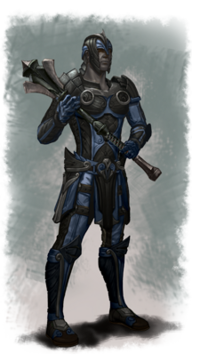 Every attack launched by the Maormer against Summerset has been led by Orgnum himself, and despite the number of wars and strategies employed by the Maormer, each of these attacks has proved to be an ultimate failure. The Maormer were allies of the second Aldmeri Dominion, although the Dominion allowed the kings of Colovia to eliminate Maormer outposts that had been established along the western coast of the mainland. The last documented appearance of the Maormer was in 3E 110 in the War of the Isle. The united alliance of the kings of Summerset and Antiochus Septim, combining the Imperial fleet and the royal navies of Summerset Isle, together with the magical powers of the Psijic Order, succeeded in destroying the Pyandonean invading armada. It was said that the storm brewed by the Psijic of Artaeum so annihilated Orgnum's fleet that he was never again able to muster together enough of a force to dare another battle. The Maormer are known to possess blank, white eyes, and a strange, chameleon-like skin that is entirely colorless, as if their flesh were made of some white limpid jelly. Their chameleon-like skin is an involuntary process, similar to the forest-coupling skills of the Bosmer which allows them to walk into the shade of a single tree and vanish. The Maormer leader, King Orgnum, is a deathless wizard who it seems is not only immortal but grows more youthful by the century. He is said to be the Serpent God of the Satakal. The Maormer practice a powerful form of snake magic. With this, they have tamed the sea serpents of their island for use as steeds and warbeasts. 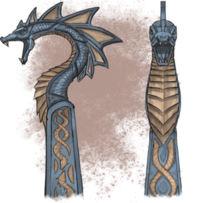 These sea serpents serve as King Orgnum's guards and occasional mounts. The Maormer's ships are described as looking insectoid, with membranous sails and a rugged chitin hull, flying a markedly alien flag. Maormer use fire salts to warm their food on long voyages. Esta página foi modificada pela última vez à(s) 20h24min de 19 de setembro de 2015.